From his earliest career Lambert showed a strong attraction for the bush and bush subjects in his art. 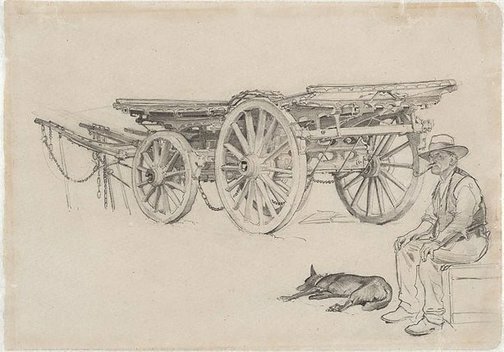 This drawing was first exhibited in 1922, and was illustrated in Art in Australia the same year. It is related to a drawing in the collection of the Art Gallery of South Australia, Portrait of a man 1921, in that the same model posed for both drawings. John H Edwards, The Ryrie family: Australian pioneers , Dulwich Hill, 2007, 72 (illus.). George Lambert, 1873-1930: drawings , Sydney, 1993, 49 (illus. ), 55. Mervyn Horton (Editor), Art and Australia , Sydney, 1975, back cover (illus.). Hendrik Kolenberg, Look , 'George Lambert's drawings', pg. 22-23, Sydney, Oct 2006, 22 (colour illus.). Editor Unknown (Editor), Art in Australia , Sydney, Feb 1922.